Posted on April 20, 2015, by & filed under House Demolitions, Personal Experiences. A phenomenon that is absent from much of Western Europe is a fear of bulldozers. A logical absence it would seem. Yet the story is somewhat different for Palestinians living in Israel and the West Bank. I am being driven to meet a Palestinian family, Atta Jaber and his wife and four children, whose home has been demolished by Israeli authorities on three occasions; the driver himself has also had his home demolished on six occasions. As we approach the Jaber family’s current home planted on a steep rocky hillside, piles of rubble and twisted metal rods can be seen which, like urban gravestones, mark the sites of their previous homes. Legally, the majority of the land in Israel and many parts of the West Bank cannot be built on or developed by the non-Jewish population; a complex system of seemingly neutral ‘zoning’ laws, effectively prohibit Palestinian’s from building on their own land. Though expensive applications may be made for building permits, they are invariably refused by the administration, forcing families to build anyway in the knowledge that their home may be demolished on any given day. The Jaber’s do not receive running water or electricity to their home as a result of their ‘illegal presence’ and so dig wells and rely on home-made generators. Overlooking the Jaber’s house about 50 metres away there are a number of houses with Israeli flags on the rooftops. It is because of the actions of this community living opposite that the Jabers have received much media attention both inside Israel and abroad. A short video captures one of the instances in which a crowd of ‘settlers’ make their way up to the Jabers’ home, with children in tow, to uproot and destroy the family’s only source of sustenance: a small garden and vegetable patch from which the family sell vegetables by the roadside. As the Jabers record the incident using a camera given to them by a human rights organisation, two men from the party can be seen proceeding to barricade their windows, whilst their children dig up plants using the families own gardening tools. This is just one of many incidents that captures the steady stream of intimidation and humiliation that the Jaber family is subject to. Two years ago, the home of Mr Jaber’s elderly father who lives at the bottom of the hill, was surrounded by tyres and set on fire by the Israeli settlers living opposite. His car was also set on fire. 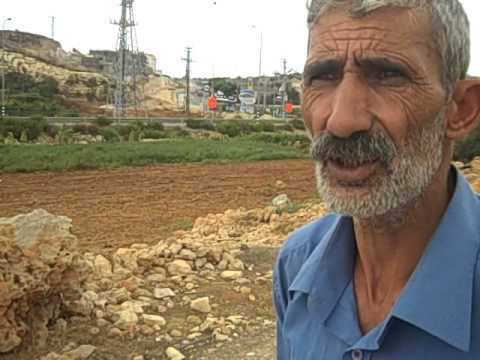 Organisations like the Israel Committee Against House Demolitions have helped to rebuild the family’s home and give the grandfather a new car which they use for bringing home crops. The family still lives below the poverty line. Mr Jaber tells me this as he continues to show me around the garden. The family’s small income has meant that their 19 year old daughter recently had to stop college because the family can no longer afford the fees. It is not difficult to imagine how this slight, weather-worn old man would cause a scene in the air conditioned offices of UN headquarters. Yet the housing demolition policy appears to be fully in force; in 2014 alone, 18,000 Palestinian homes were demolished, many of which were in Gaza, where families still await building materials to repair the damage. Under Article 53 of the 4th Geneva Convention, of which Israel is a signatory, it is illegal to destroy or confiscate a civilian’s real or personal property. Only time will tell if this, and other international law provisions, will be fully honoured by the state of Israel. Article by Chris M, British barrister and ICAHD volunteer.